There is a diversity disconnect, reports Adobe. Nearly nine in 10 creatives (87%) say a diverse workforce should be an industry priority, yet only 54% believe diversity in the creative industry has improved over the last five years. Adobe's "Creativity's Diversity Disconnect" study explores the unique barriers for women and people of color in their pursuit of a creative career. The survey finds these challenges occur from the beginning of their careers. "I was particularly struck by the finding that creatives of color are twice as likely to perceive a lack of access to tools and training as a significant barrier to entry," says Khoi Vinh, principal designer, Adobe. However, while most research on diversity in various creative fields focuses on the representation of diverse talent entering and advancing in the industry, Adobe sought to delve also into career advancement. Women, in particular, face a steep climb in their career progression. They are nearly twice more likely than men (23% vs. 14%) to feel that their gender will negatively impact future success. Bias and exclusion stall women and people of color but also impact work. More than eight in 10 creative professionals (82%) say their most successful projects were developed by a diverse team. Creatives of color feel the barriers to success more intensely than their white colleagues. Two in three white creatives (66%) say they feel their colleagues value their contributions, compared to 55% of people of color. Adobe outlines recommendations to increase diversity within the workforce. First, the industry needs to rethink the education system. Fewer creatives of color graduate with creative majors than white creatives (44% vs. 57%). Also, there needs to be role models to inspire the next generation of leaders. Everyone needs to become a "diversity champion," says Vinh. “Our hope is that the insights from our study will help build awareness, amplify the conversation, and provide a basis for action in education and the workplace for women and people of color." This report hopes to spark additional conversation via the #CreativityForAll hashtag. 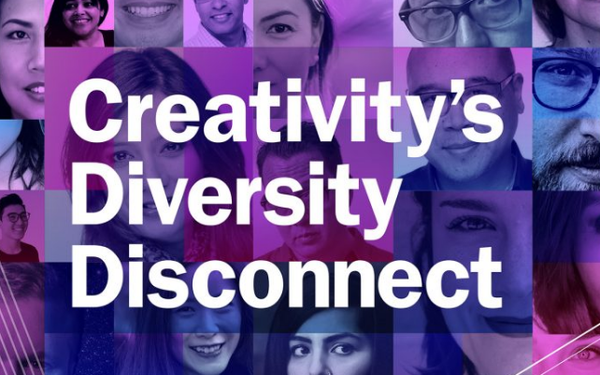 The “Creativity’s Diversity Disconnect” survey queried 750 U.S. creative professionals online in August and September about their perceptions of diversity and experience in education and the workplace. Adobe also interviewed 10 U.S. creative professionals, educators and community leaders. The survey research was produced by Edelman Intelligence and the interview research by Weber Shandwick's Tai Wingfield.